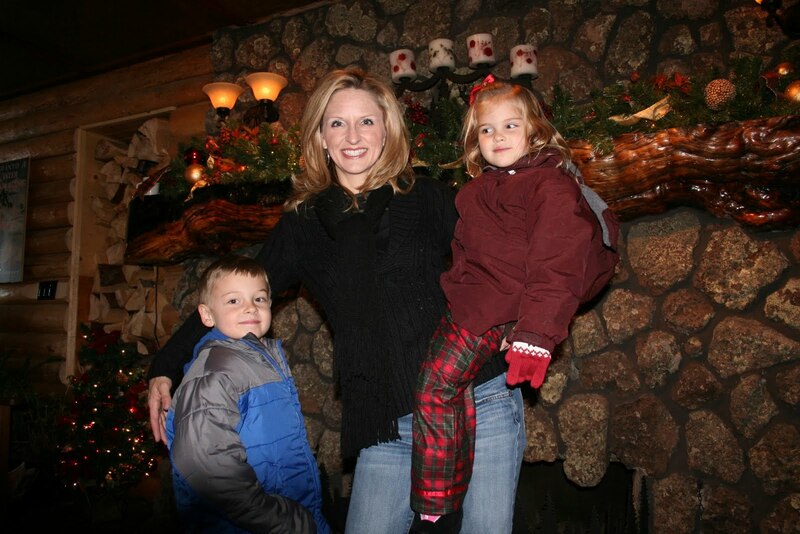 In the month of December, I try to make the magic of the Christmas come alive for our children. 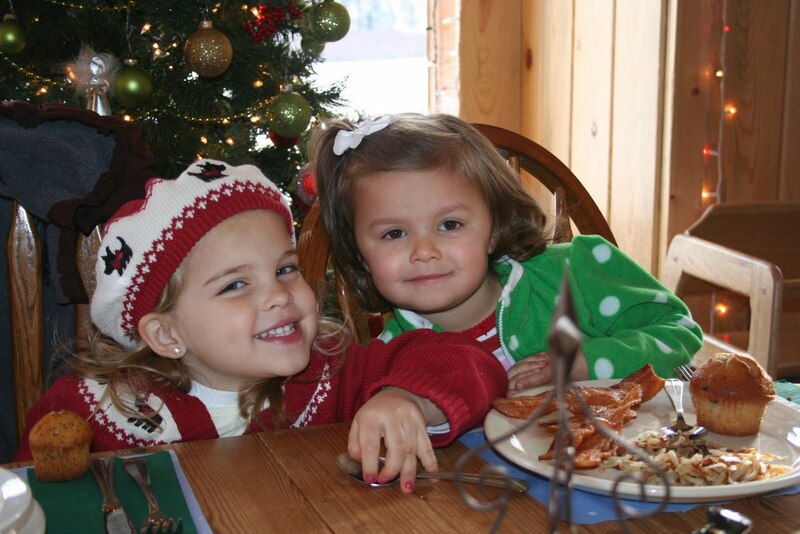 I have so many fond memories of my childhood Christmas’ and I want the same for my children. 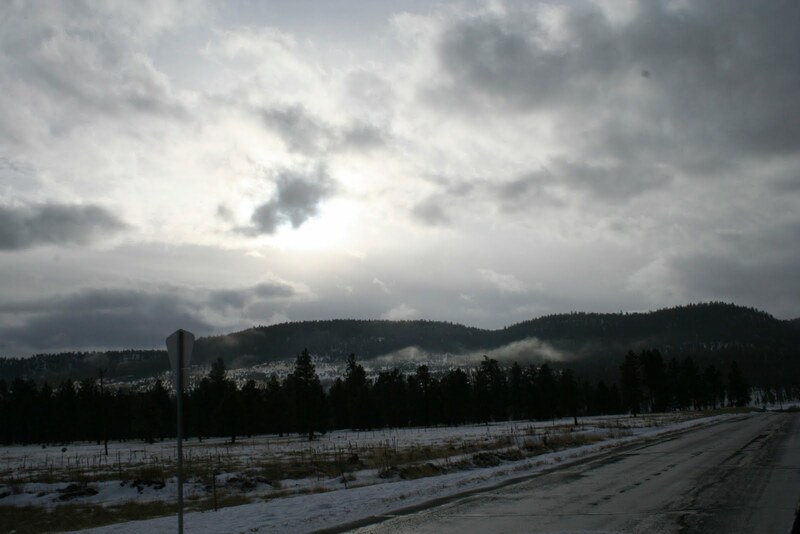 When I learned of the inaugural year of a new experience in Greer, Arizona, I was intrigued. 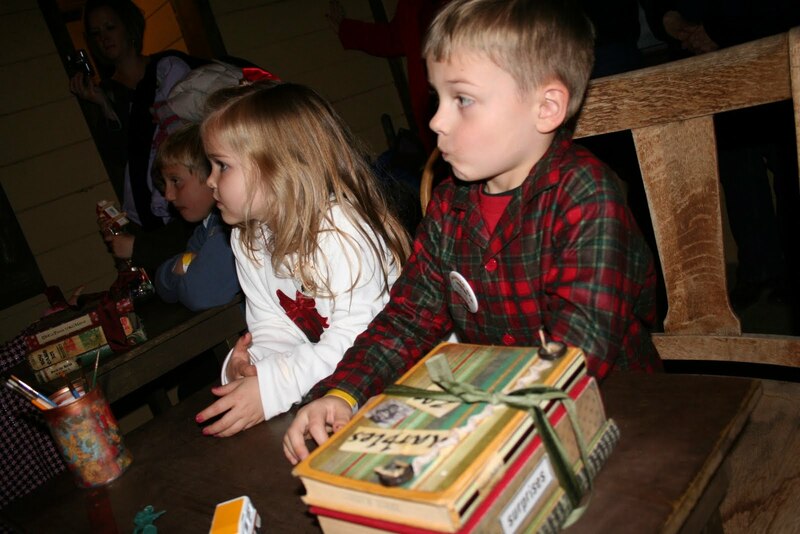 We have done the Polar Express in Williams, but after reading online about what the children get to experience in Santa’s Workshop at NPX, I was truly impressed. 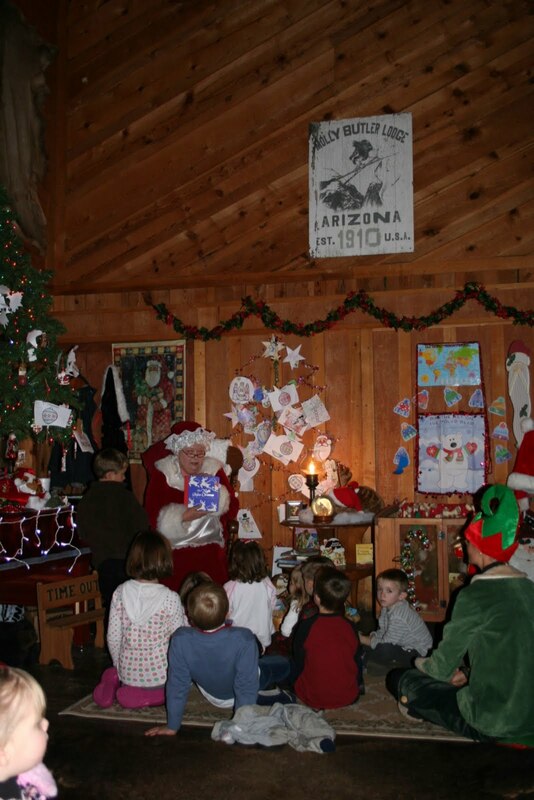 Nestled approximately 4 hours north of Phoenix, in the breathtaking beautiful mountains of Northern Arizona, near the Sunrise ski area, Greer is officially now home to something I think will be the most popular Christmas experience destination! 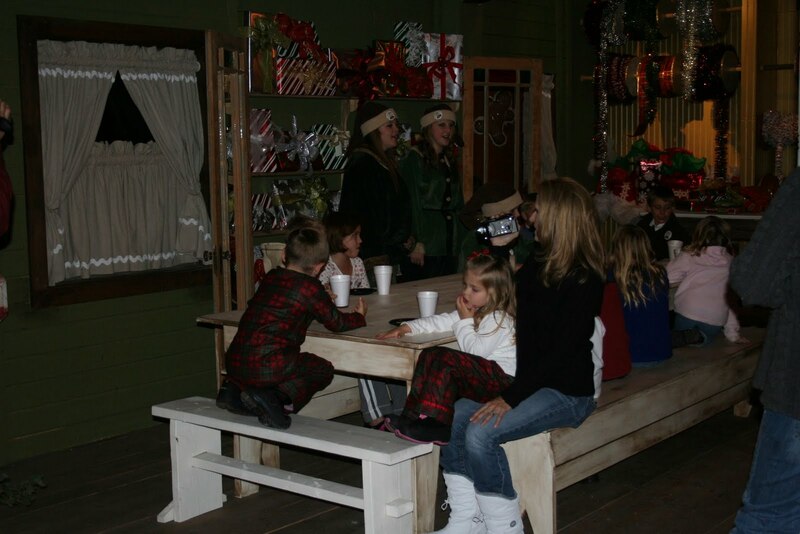 In the past the hot ticket in town was booking your “other” Christmas experience” a full year in advance, but truthfully, that ticket is nothing compared to what Greer now has to offer. 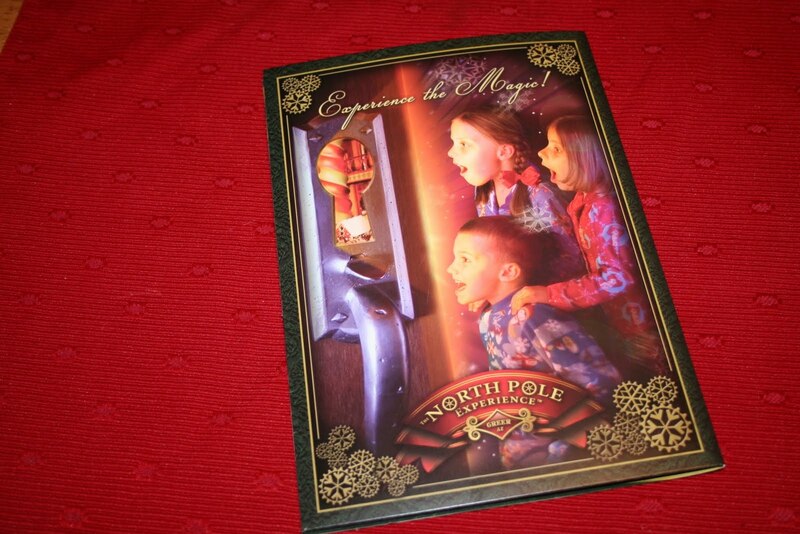 The North Pole Experience was designed to give children, a never before, behind the scene peak into Santa’s workshop. 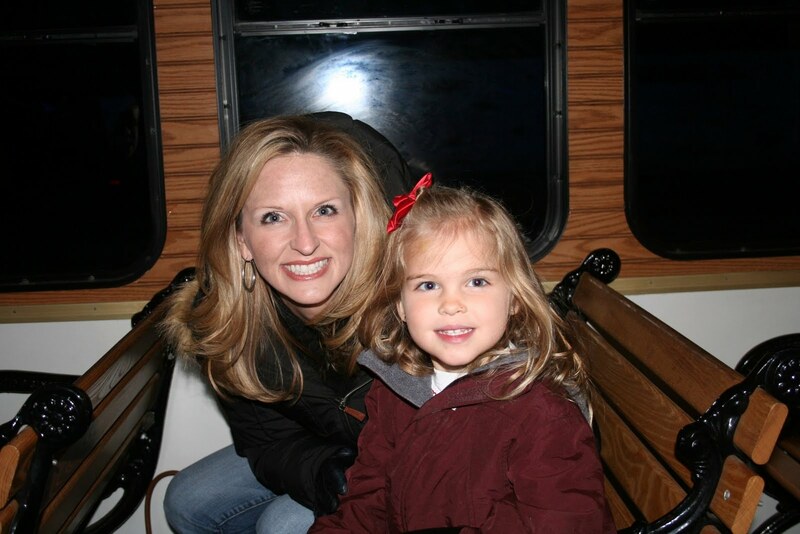 The NPX gives families an experience unlike anything they have ever experienced. 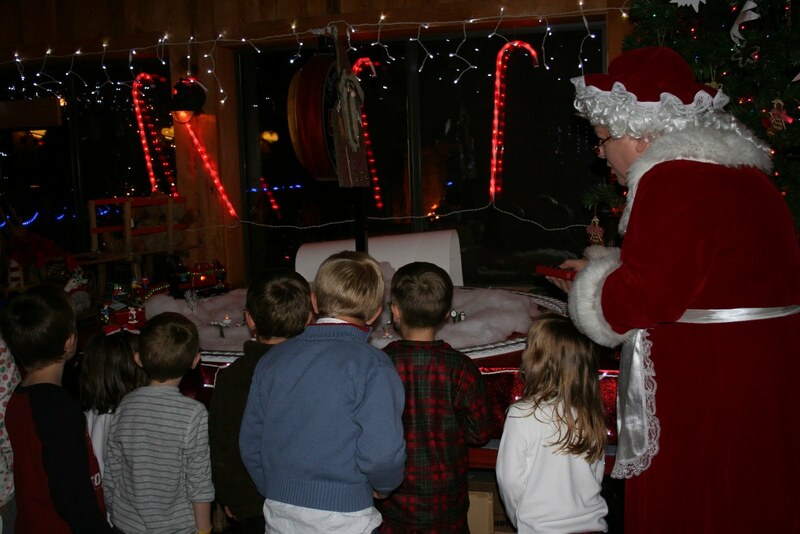 If your little ones still believe in the magic of Christmas and Santa Claus, this is a trip you must take. 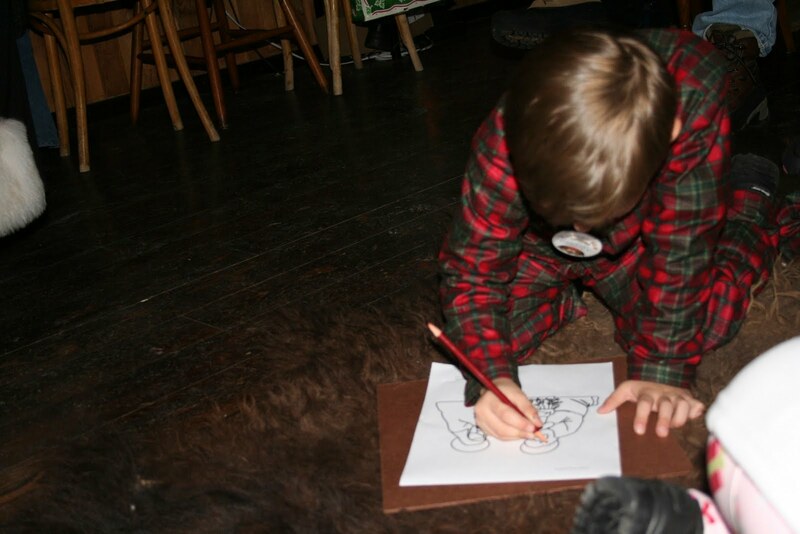 From start to finish, our experience with NPX and Molly Butler’s Lodge was perfection. We have nothing but incredibly great things to say about everything from our lodging, to the meals, and the friendly people. 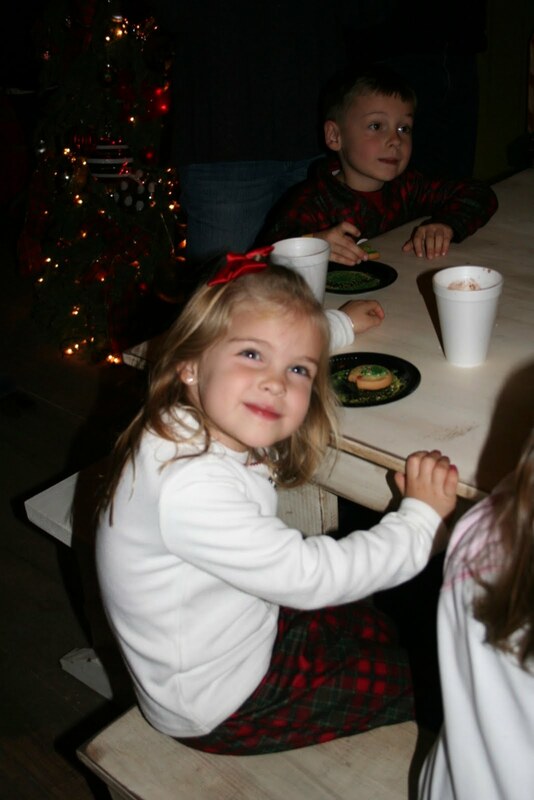 But Santa’s Workshop was the icing on the cake. 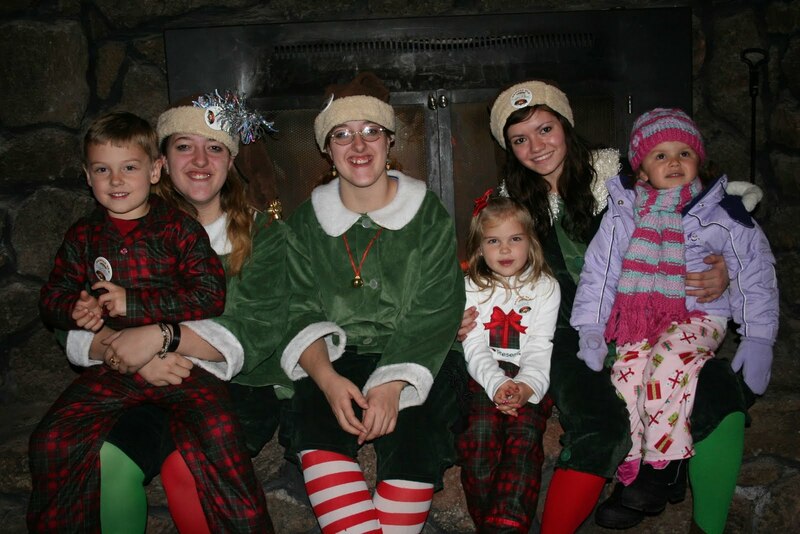 The adventure that the elves take the families on is so much fun. I’m all about making memories for my children and as we were experiencing this together, all I could think of was, this is something that will stick with them for their life. Even as they grow older and they look back at their childhood memories, I know this one will hold a special place. I honestly cannot wait to have a conversation with them when they are adults to hear in their own detail about what this trip meant to them. I know it will be special. The detail and thought that has gone into the planning is perfect. 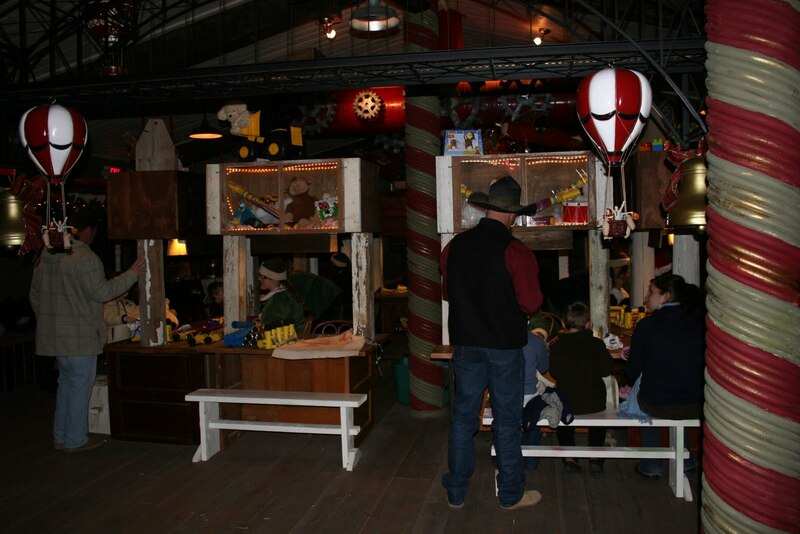 From the very minute when you walk inside and see all of the toys on display to Santa’s mail bags and decorations – it’s darling. 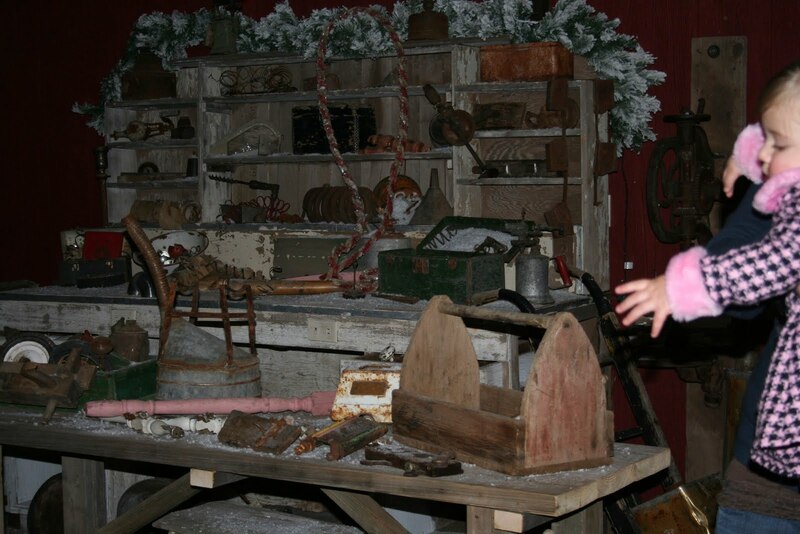 But when the Elves give the secret knock and let all of the enthusiastic children inside to see the actual workshop, it will blow you away. We walked into a room filled with amazing decor, a raging – wonderful fireplace and a smell like nothing we had ever smelled before. I don’t know how quite to describe it but if I could have stayed there all night and just smelled the aroma, I would have! Its exactly as I would have expected Santa’s North Pole to smell like! 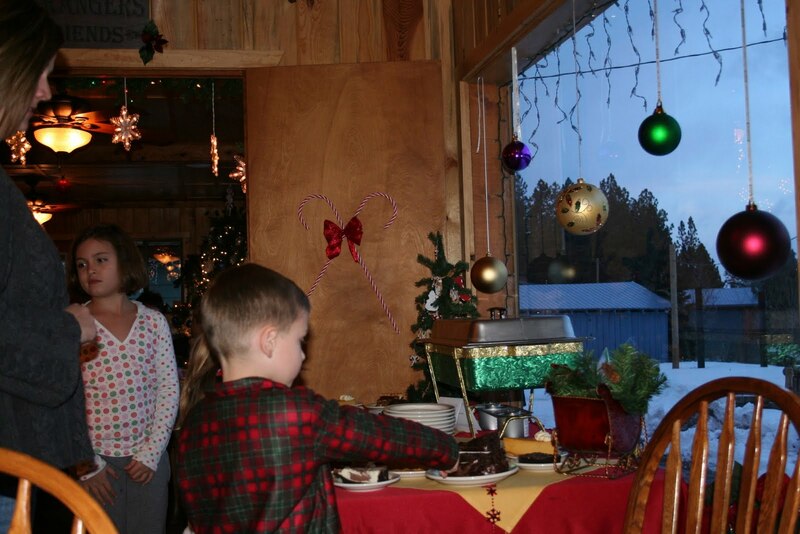 A letter from Santa and the details of our lodging and meals. 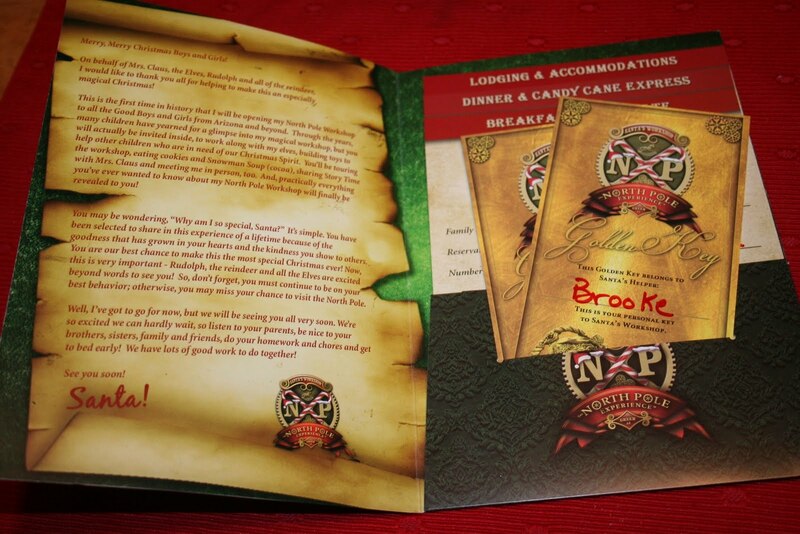 The NPX offers many great packages. I strongly encourage you to take advantage of the packages that include the meals at Molly Butler’s. I’ve learned that this lodge is one of the top 25 places to eat in Arizona and everything we ate was delicious. Both of our dinner and breakfast was fantastic. The staff and chefs were incredibly friendly. I hate to keep comparing this experience to the Williams event, but for those of you that have done it, know the food there is nothing to brag about. The NPX actually is! 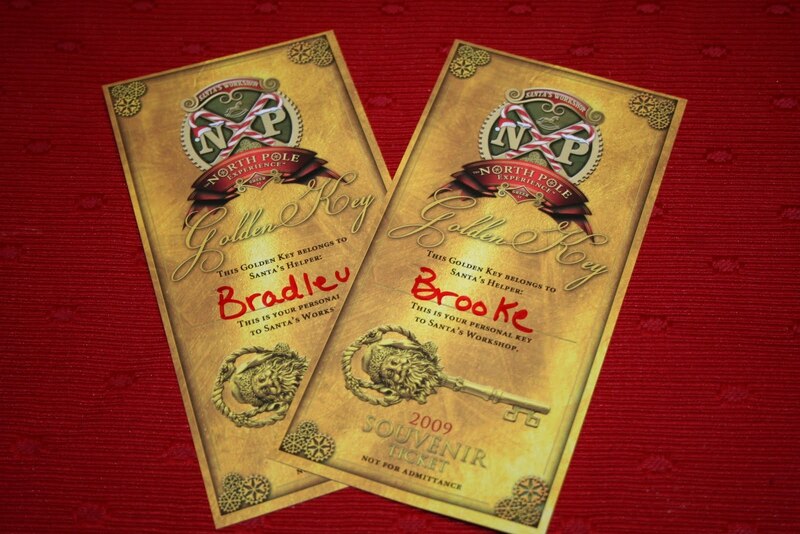 Not many children are ever allowed in Santa’s Worshop and these are the Golden Key’s to grant you access! They are Souvenir Admission tickets. There are many wonderful places to stay in the Greer area, but we had the opportunity to experience a Molly Butler cabin. Check in was a breeze as they had everything awaiting our arrival. We stayed in the Weber Cabin, nestled in the mountains. 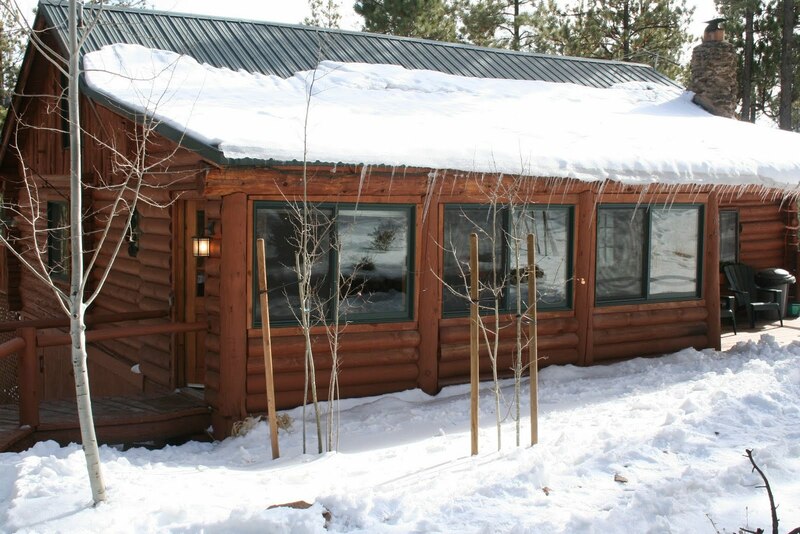 The driveway had been cleared of snow for our arrival and the cabin was perfect. Completely set up with everything and anything we would need. It was very clean and was an absolutely perfect experience! We had a lot of beautiful land and views all around us. The privacy was great. The drive to Molly Butler’s was about 5 minutes. Having the all inclusive package plan was wonderful. We didn’t have to worry about dinner or breakfast plans. At the lodge ready for dinner. Trying hard to pick a dessert, they all looked fabulous! 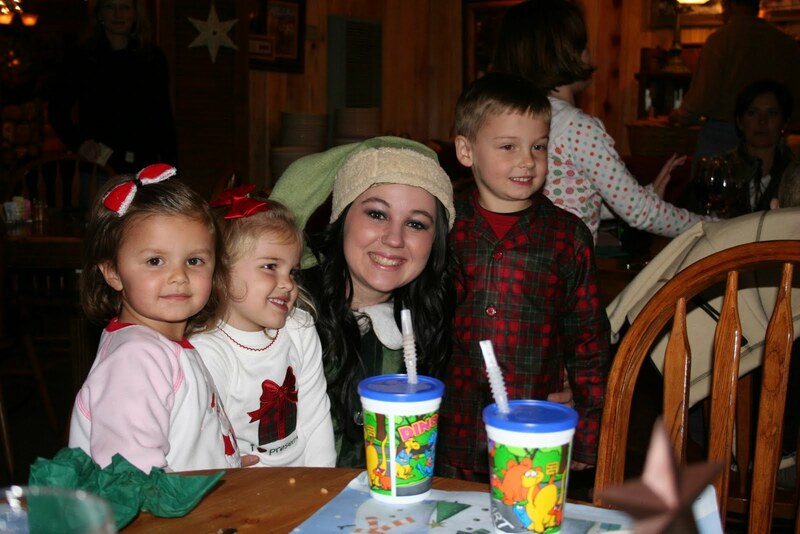 Our Elf Sprinkles and 3 very excited kids. Everyone was incredibly friendly! 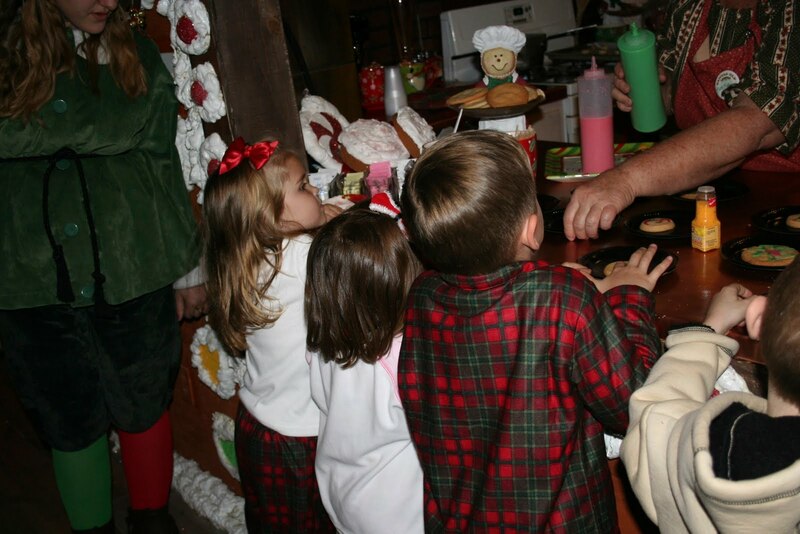 Even the chefs would walk by and ask the kids if they were excited to meet Santa. 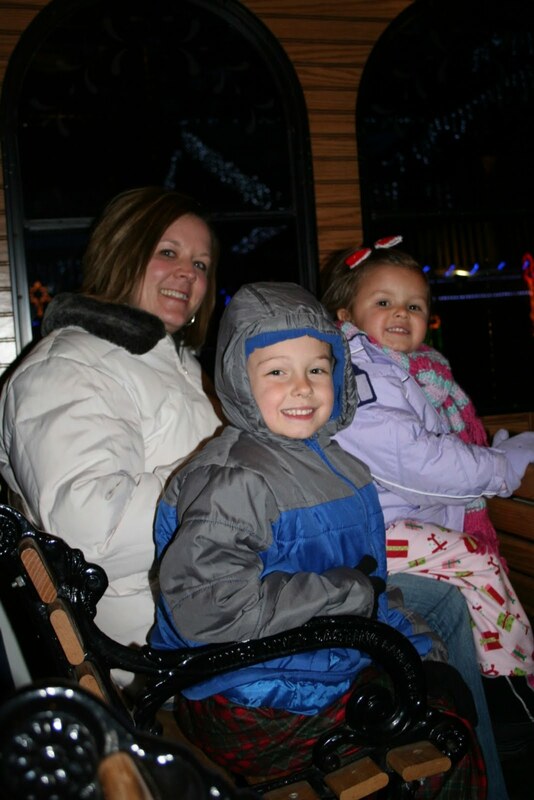 We are finally on our way on the Candy Cane Express! 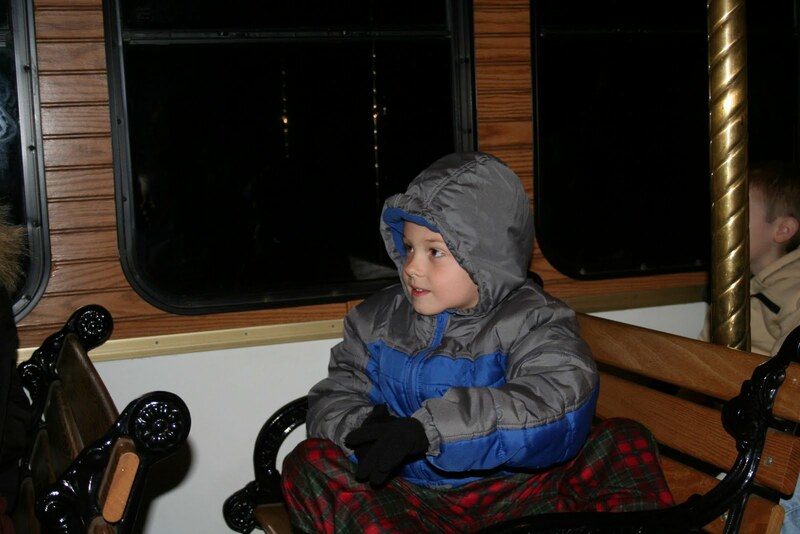 We sang a few Christmas songs, said the magic words to get through the tunnel to the North Pole, saw many large Elk. It was a great ride! 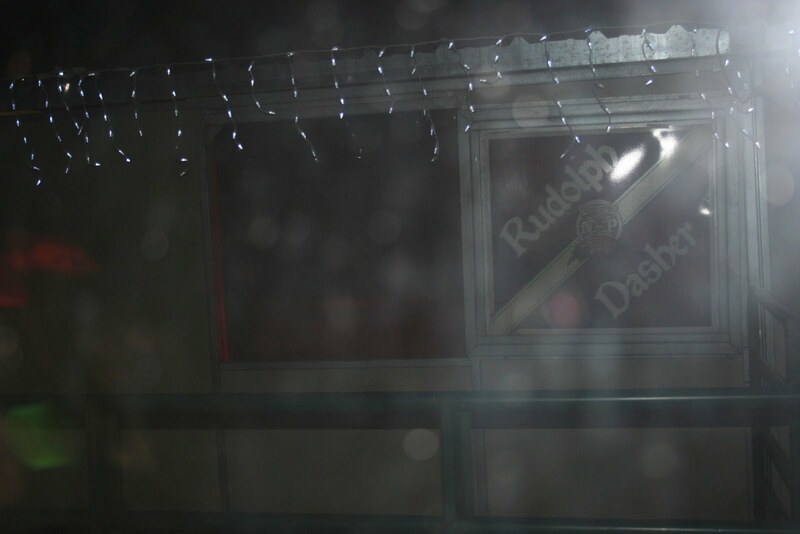 Hard to see in this photo – but we went right by where the reindeer sleep and there was a red light coming from Rudolph and Dasher’s area! All of the kids on board were full of excitement when they saw this! THE DOOR! 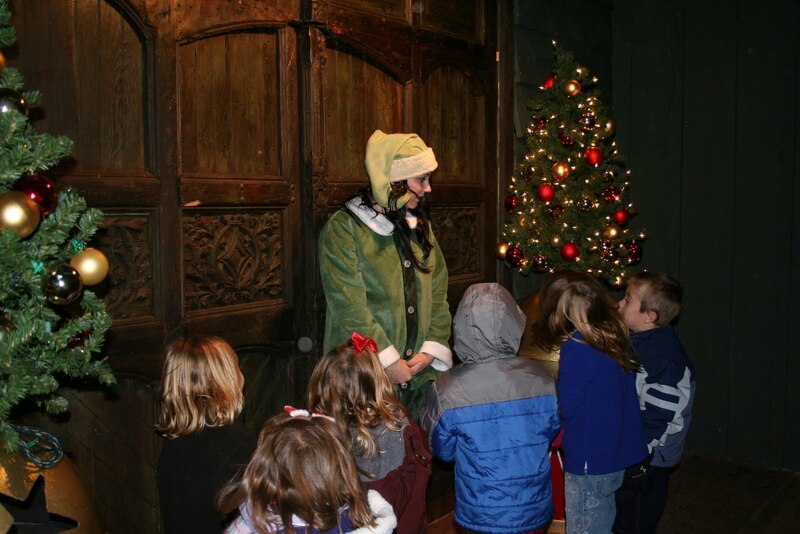 The door that they had to do the magic knock that allowed Santa’s new Elves into the workshop! Sprinkles telling them all about what waited for them inside. After we went through the museum of toys, we were met by one of the head elf’s Alabaster who told us all about Santa’s favorite word. Can you guess what it is? Enthusiasm! 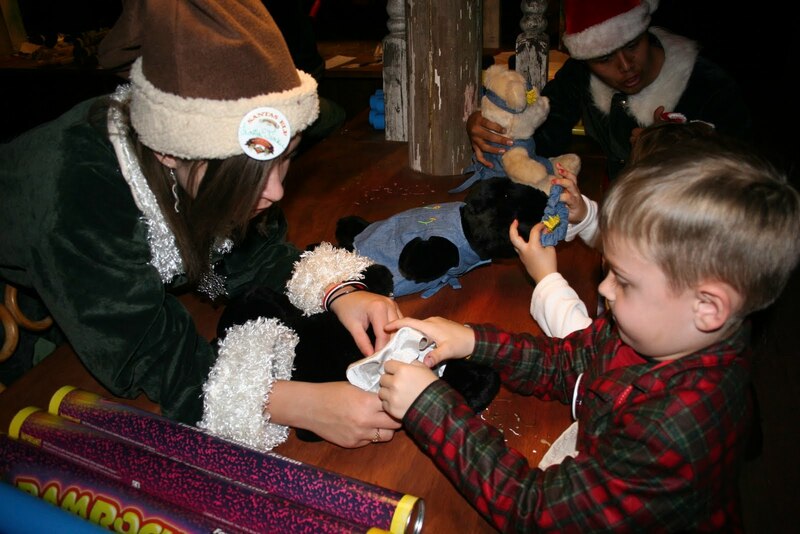 The kids had to have a lot of enthusiasm to help all the elves make toys for Santa’s big night! 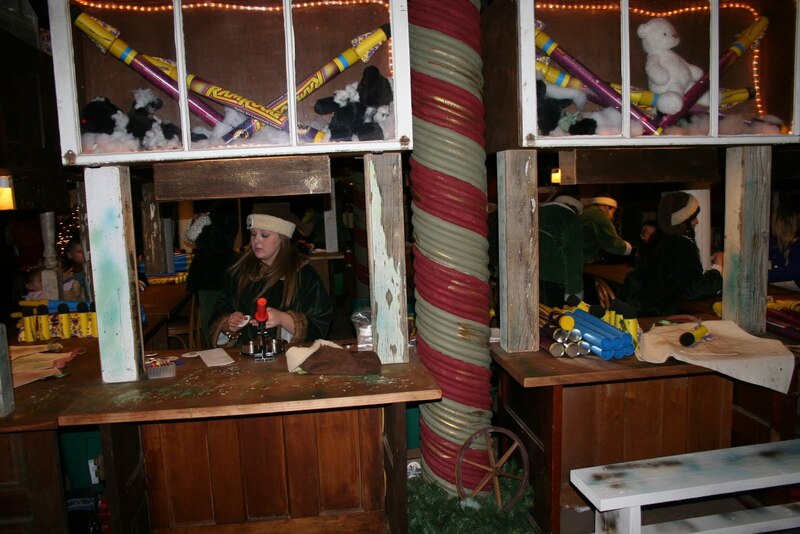 The work shop with busy elves! Seriously 11 days? Wow, the big day will be here before we know it! When we walked into the workshop it was toasty warm thanks to this amazing fireplace. It also smelled like nothing I have ever experienced. 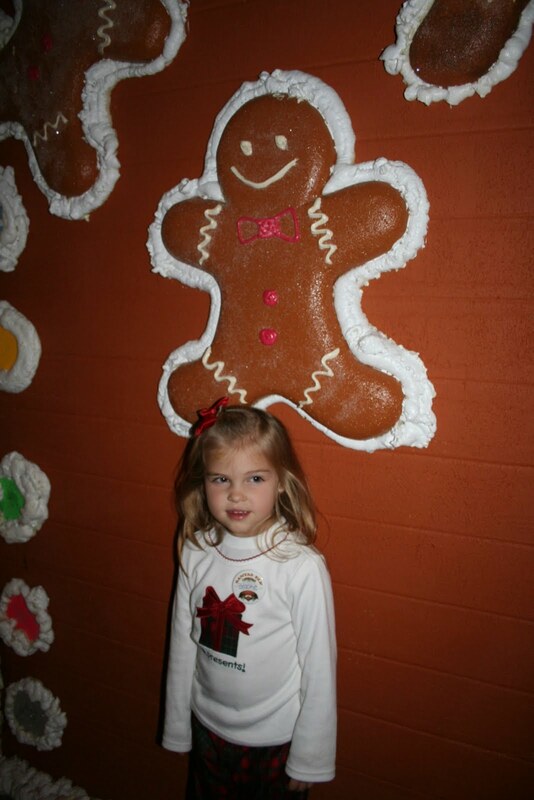 Freshly baked cookies, gingerbread, cinnamon and fresh pine trees – it’s so hard to describe – it was amazing and just how you would imagine Santa’s workshop to smell. Seriously I could have stayed there all night taking in that smell! 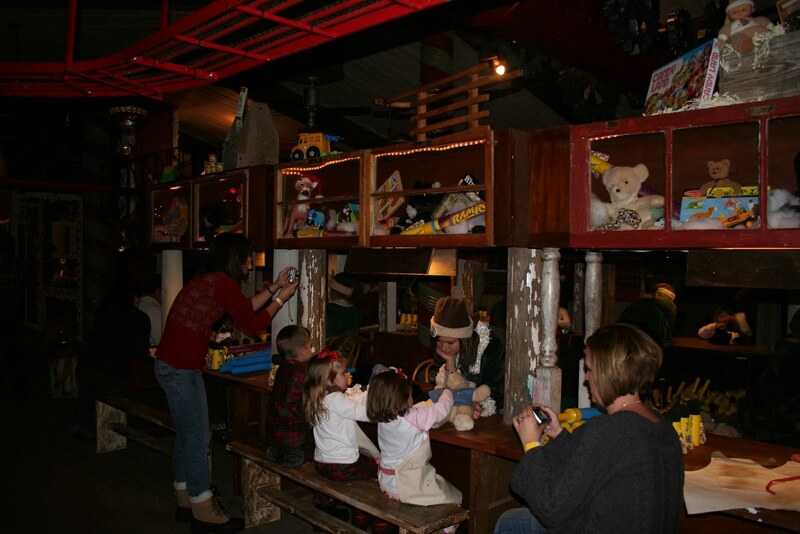 The kids working hard to build toys with the Elves. 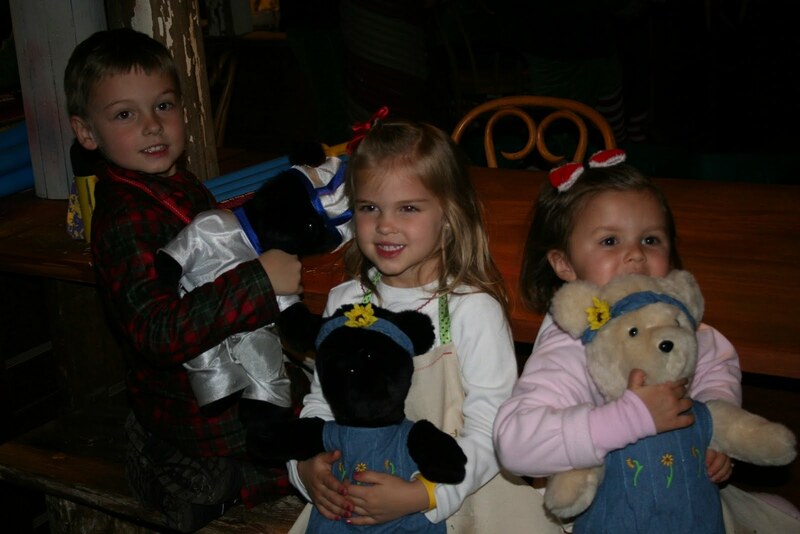 All of the toys that the kids make are actually donated. Wow! The workshop was decorated with perfection! Every detail had been thought out. 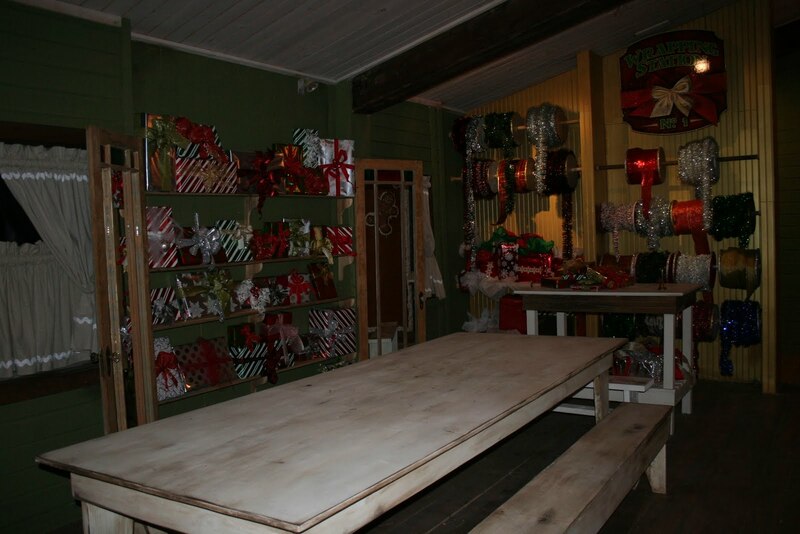 This was the wrapping corner and it was darling. 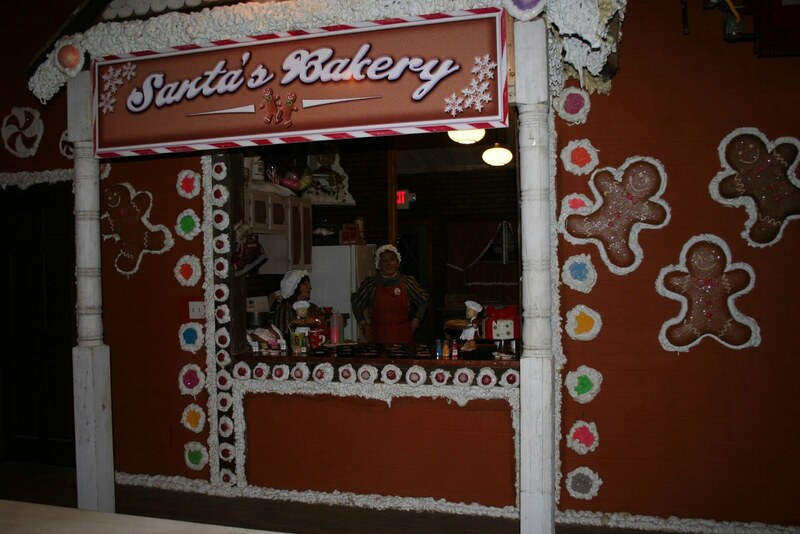 Santa’s bakery! 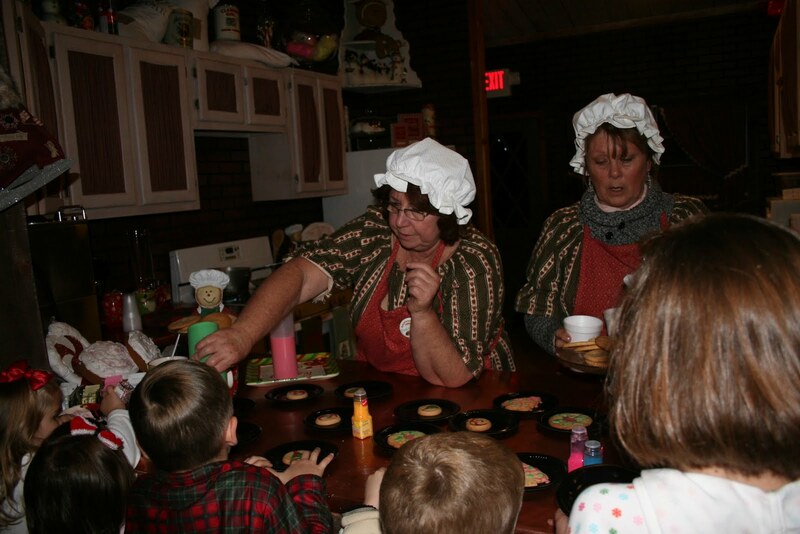 The kids loved getting their cookies from here. 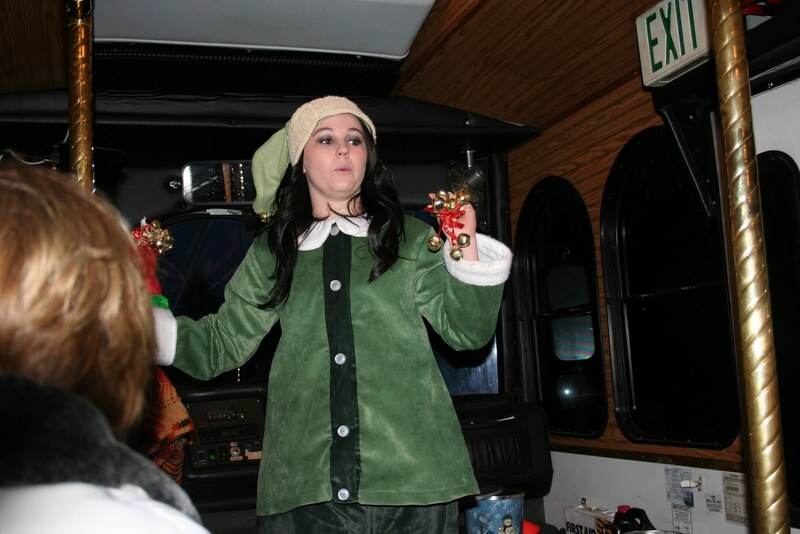 After the Teddy Bears were made, the main elf came over to inspect them. 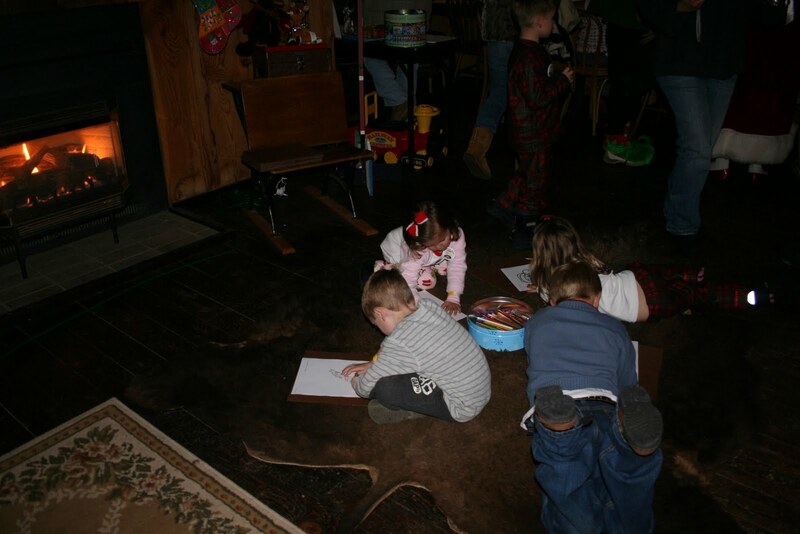 The kids loved the idea that they were helping Santa get ready for Christmas. 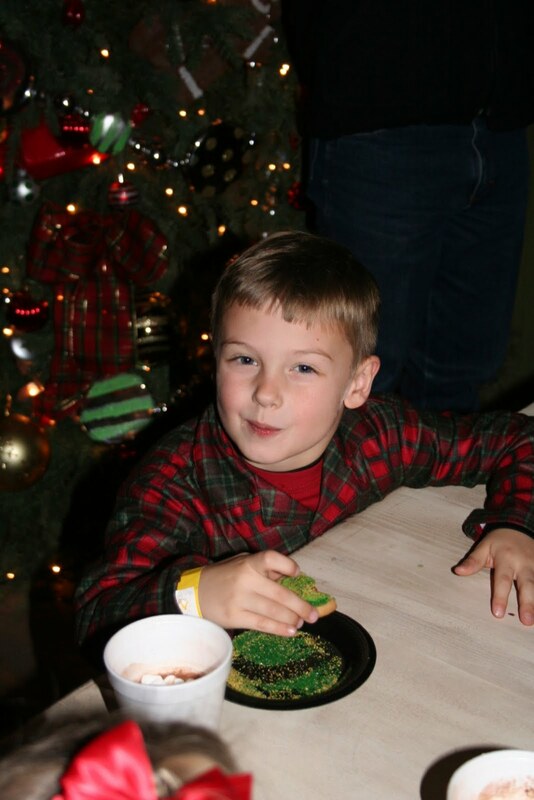 The kids could hardly wait to get his cookies iced and sprinkled! 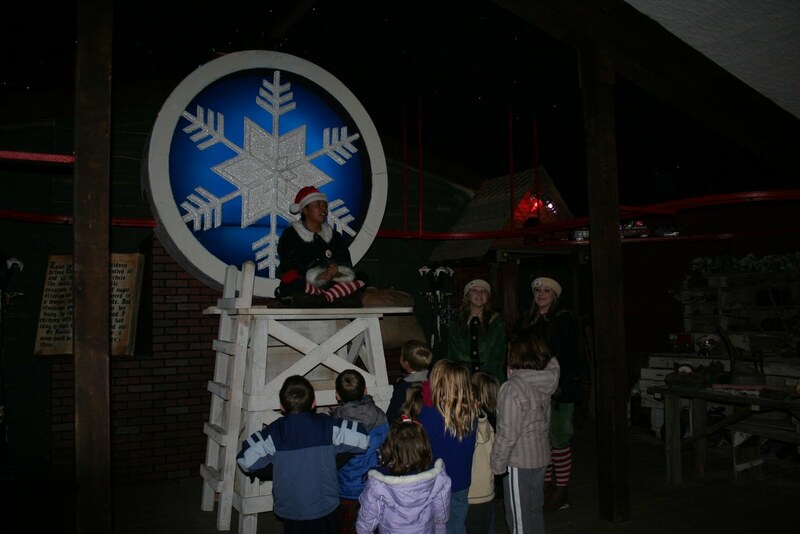 And what should before my wondering eyes should appear….Santa make a quick appearance to tell the kids Hello! After snack time, it was school time. 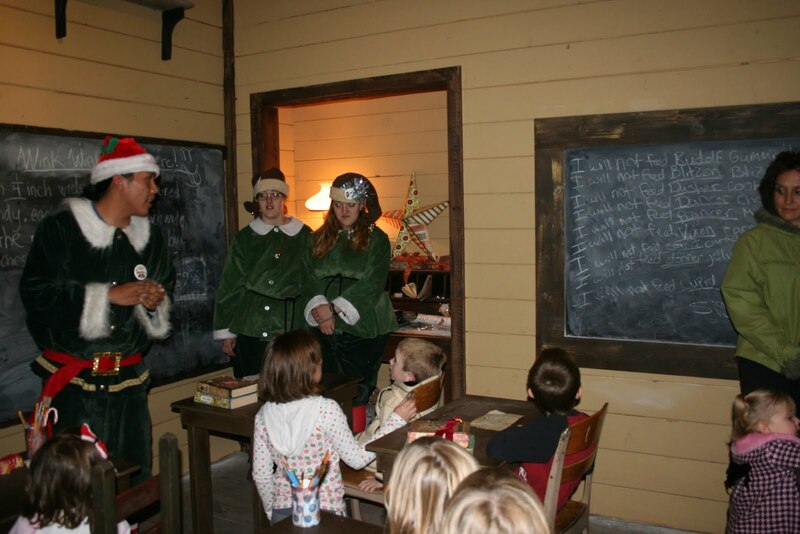 We went into the Elves classroom to learn how to be a good elf. It was really cute! The detail that each room had was darling. The old fashion school desks and chairs with the books. We loved looking around noticing all the touches! 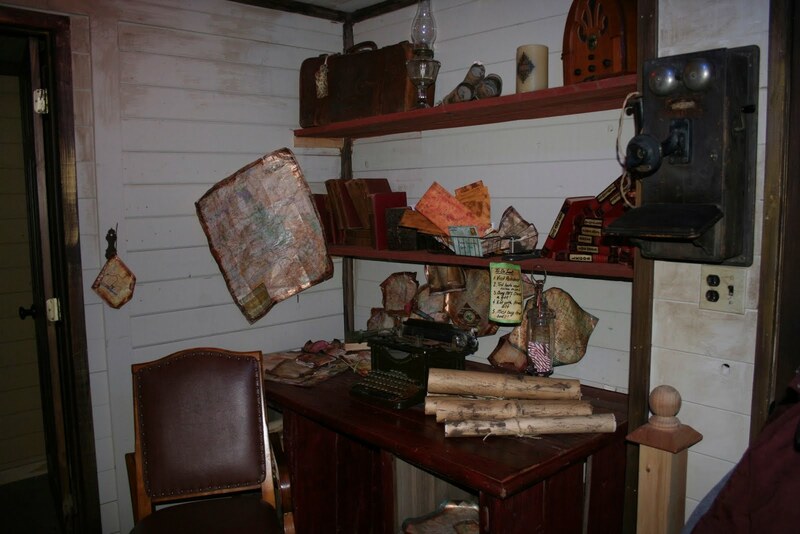 Right outside the school room was Santa’s desk. He had lots of maps for planning his big night’s trip! 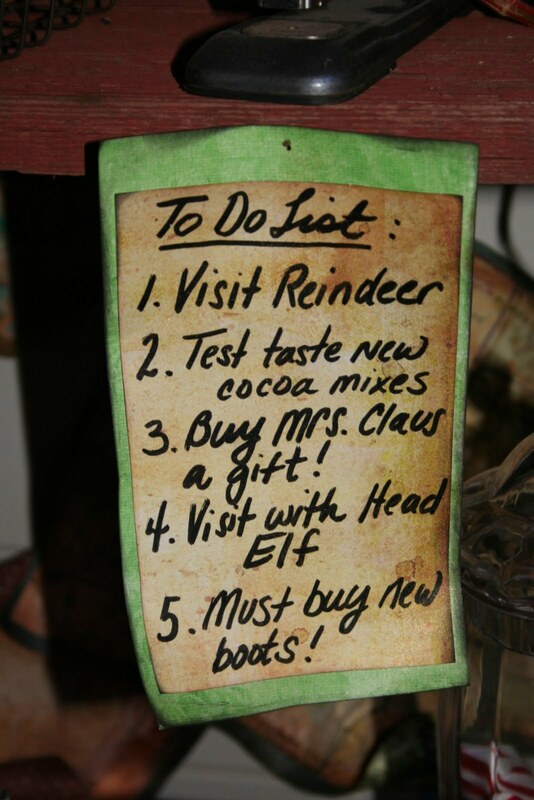 And his To Do list too! 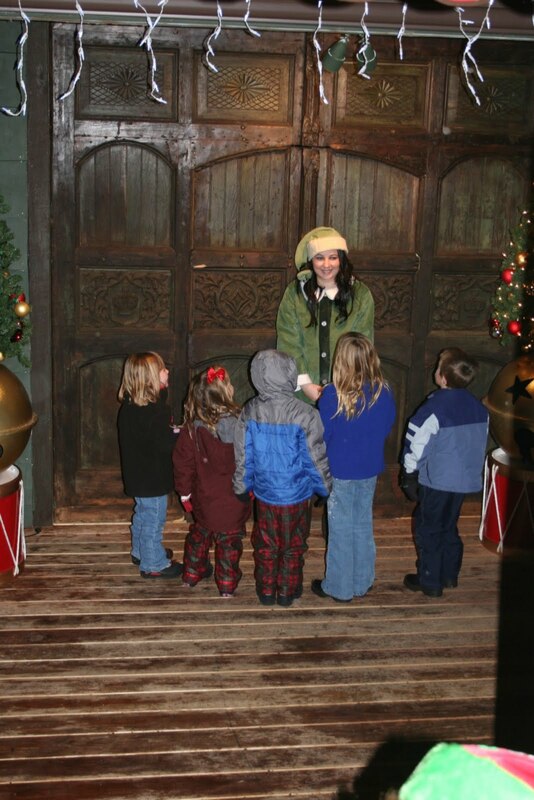 After class, it was off to the Elves playroom. And then meeting the big man himself. I learned after taking this photo that no personal photography was allowed. Whoops! But they took great, quality photos and will be emailing them to us soon. The elf taking the photos was very nice, patient and took several, making sure the photos were good. 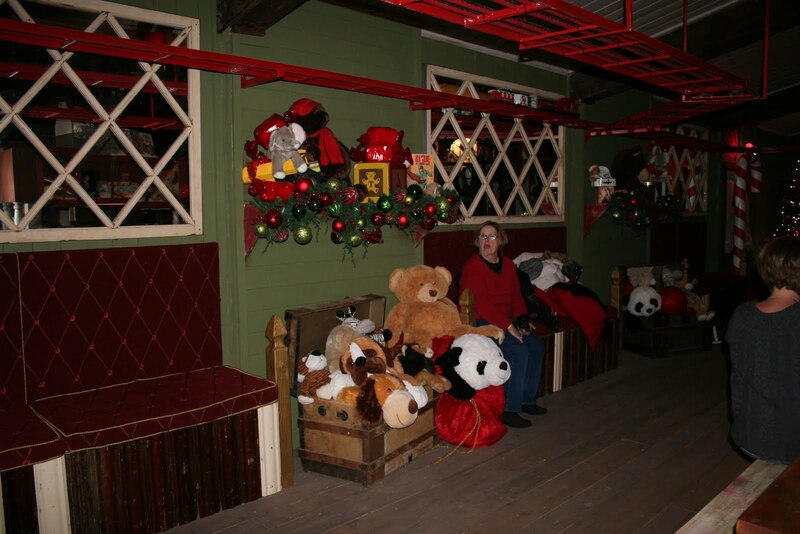 The cost for photos was $10.00 – if you’ve been the germy mall Santa you will know that this is a really good price. 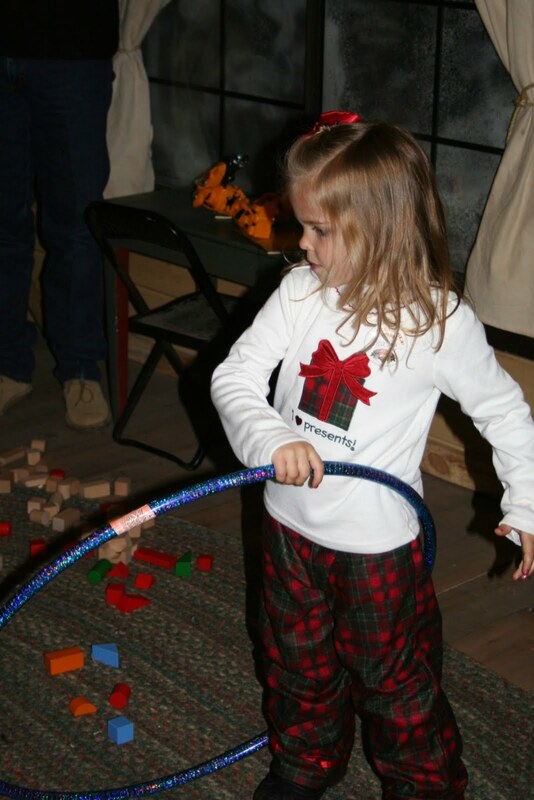 The process to see Santa was done great. 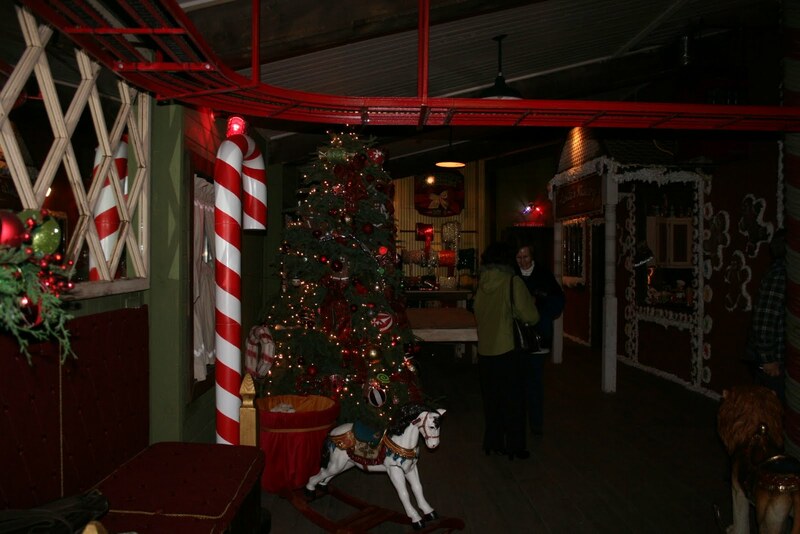 Only one family was allowed in at a time, so you had Santa all to yourself, in a very quiet, quaint and cute atmosphere! 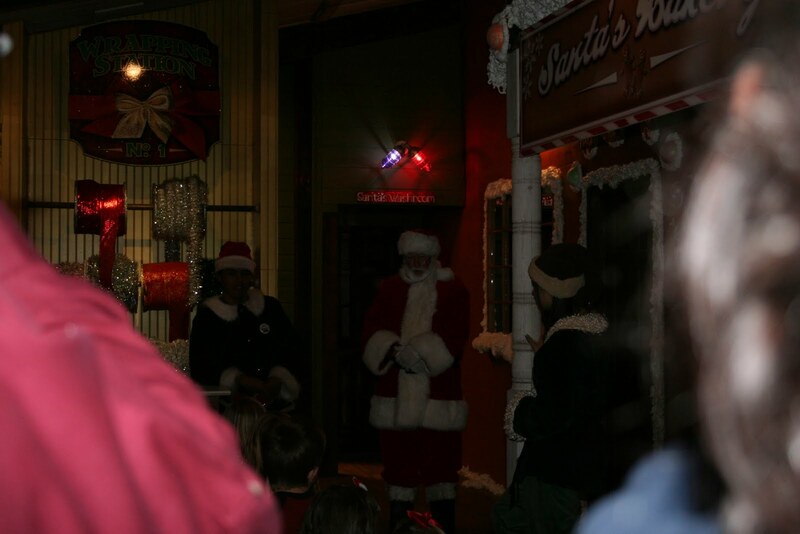 Horrible photo, but as we loaded up to leave on the Candy Cane Express, Santa came out and waved goodbye to us. He threw kisses, etc. The kids loved it! Such a fun touch! 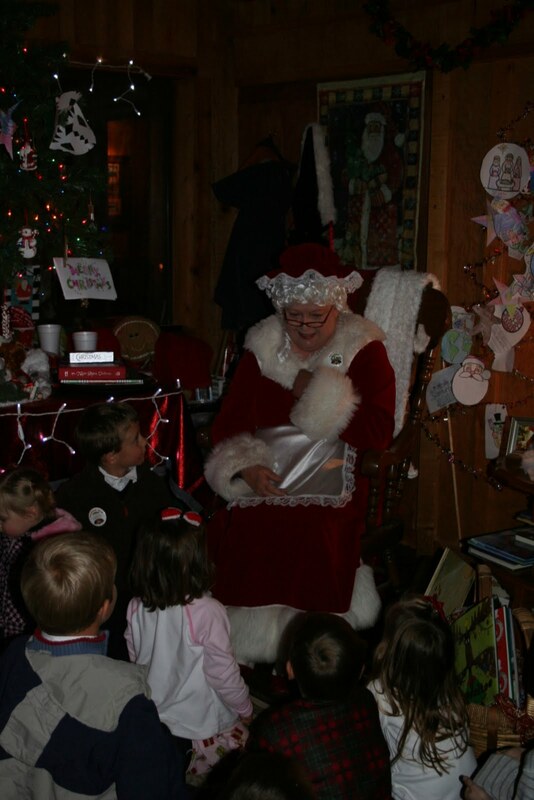 Back at the Lodge, Mrs. Claus was waiting with a warm fireplace going and lots of books for storytime! 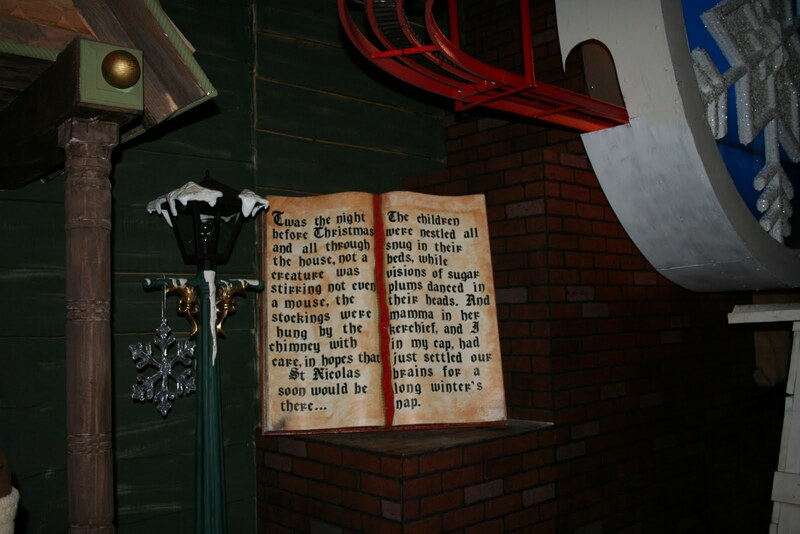 This was the most amazing “Night Before Christmas” pop up book. 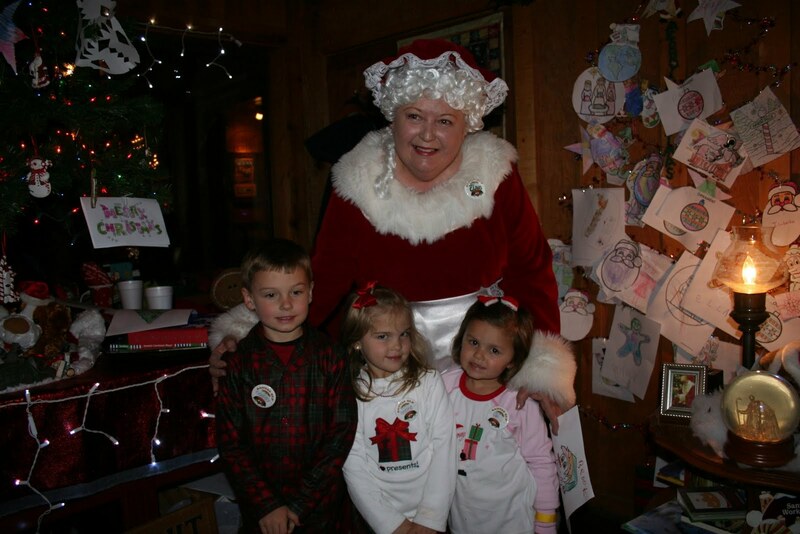 Mrs. Claus showing the kids the train that Santa gave her. Delicious food and really great service! Before I finish writing about our experience, I am compelled to share something that we witnessed during our trip. I’m the type of person that when I see someone go over and beyond or if we receive really great service, I always make an effort to call the establishment back and speak to the manager, letting them know about a particular employee or experience. I feel like managers only hear about the negative and the bad occurrences and more often than not these days, I feel customer service lacks in many industries. 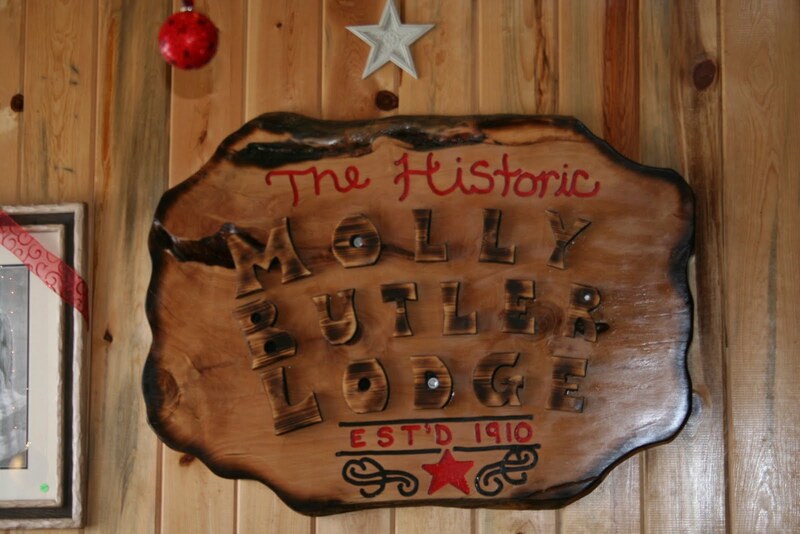 But what we experienced sitting in Molly Butler’s Lodge while we waited for our dinner hour needs to be noted. You, reading this blog, as potential customers of NPX and of Molly Butler’s Lodge, you should be aware that excellent customer awaits you. 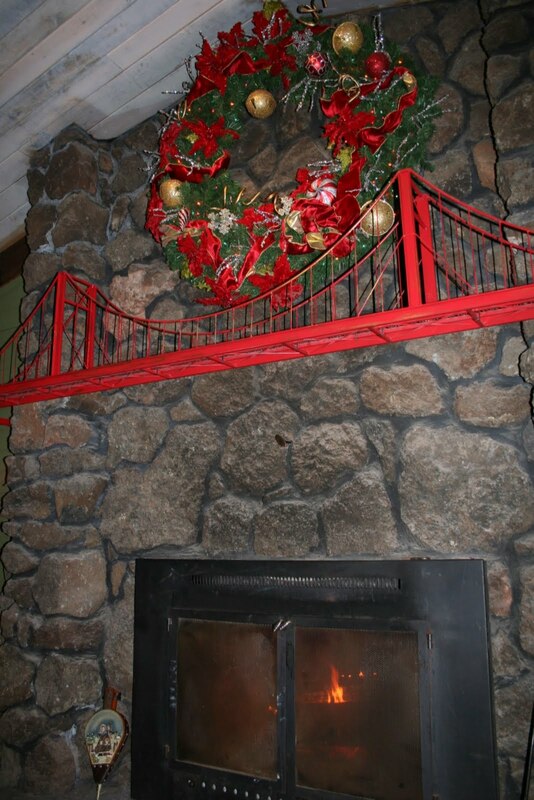 As we sat near the fireplace in the lobby, unbeknownst to us, one of the owners, Allan Johnson came over and started putting more wood in the fireplace, getting the fire going. We ended up starting a conversation with him and learned that we happen to live in the same neighborhood back in town. He told us that he was on his way out of town, back to his home, when he came across a family of 6 who had lost control of their car about 45 minutes outside of Greer and was stranded. He had a long drive home ahead of him, but took the time to stop, load them all and their 3 large dogs in his car and drive him back to Molly Butler’s Lodge. He called them a tow truck, tied the dogs up on the porch, got the dogs water and told the staff to take care of whatever they needed. 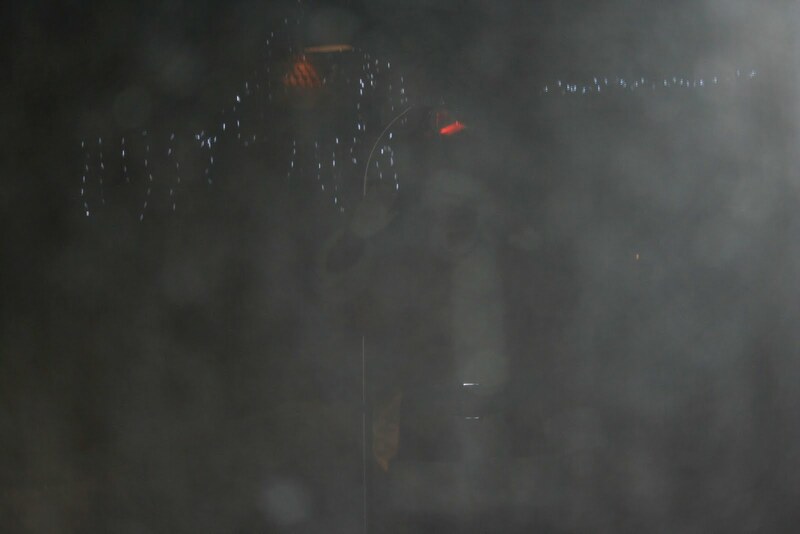 He was prepping the fire and was just about ready to head back out of town, now in the dark snowy night. But before he could leave, an elderly person traveling with the family had a major medical issue. We saw first hand his compassion for this family as he saw to it that they got what they needed. 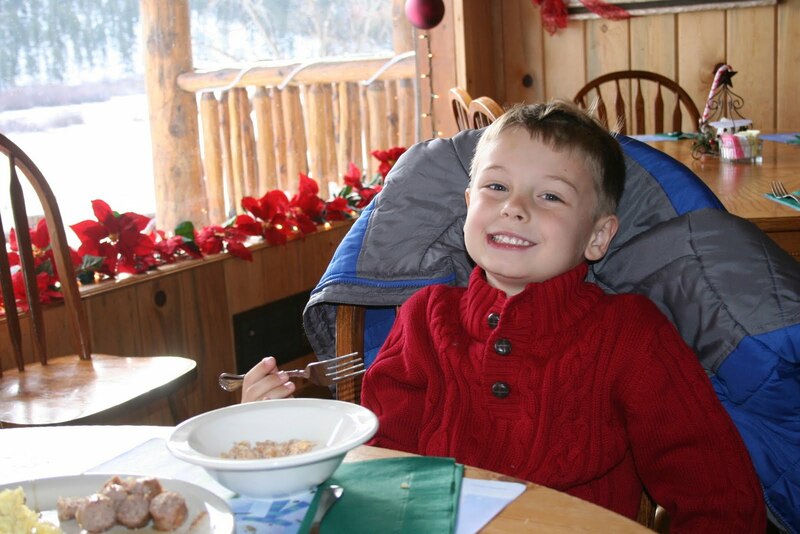 After everything had settled down for the family, he invited them all into eat and treated them all to dinner. All while chasing down one of their dogs who had gotten loose. A good samaritan, who could have easily kept traveling home to his family, stopped and helped out a family who so tremendously needed help. He again could have left them with someone at the lodge and leave, but he did not. He saw to it that they were well cared for. It resulted in causing him to head home the following day. You do not see this every day in the business world and being a little fly on the wall watching it all play out, we were very impressed with not only how he helped the family, but he did it with true compassion. 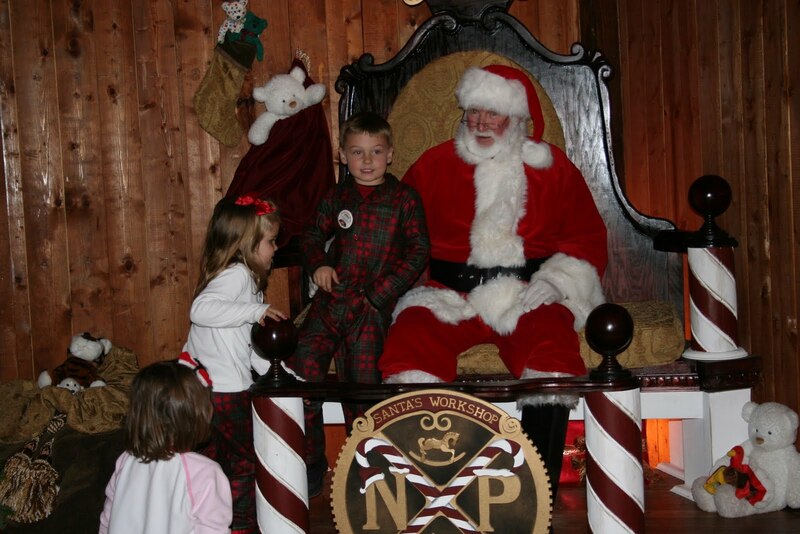 Coupled with that type of service and add a little bit of Santa’s magic, The North Pole Experience is truly something that you should consider. It will be a wonderful family memory. There are currently many openings for this year and if you at all have the chance to make it to Greer before we ring in 2010, I highly recommend it. 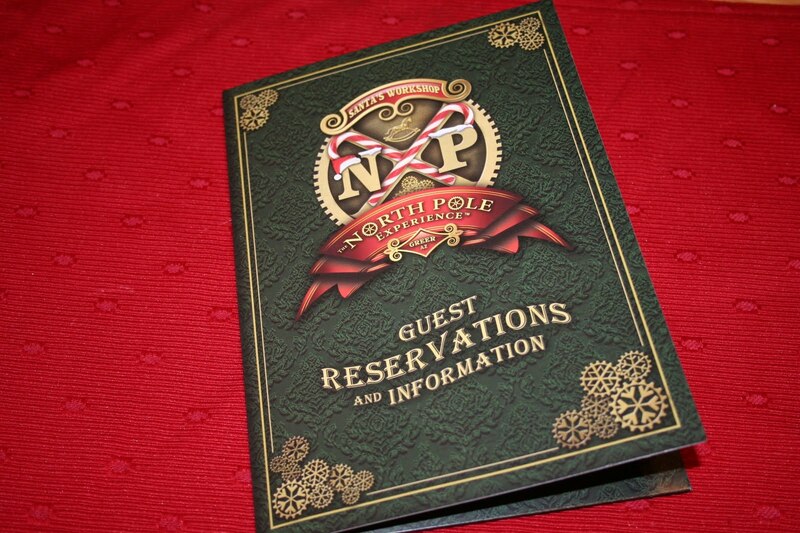 If this is something that intrigues you for next December, I have a sneaking suspicion that once the word gets out about how great this experience is for families that they will fill up rather quickly for 2010, so make sure you look into it soon. On a side note, if you head to Greer for the NPX, make sure you take in other activities in the area. 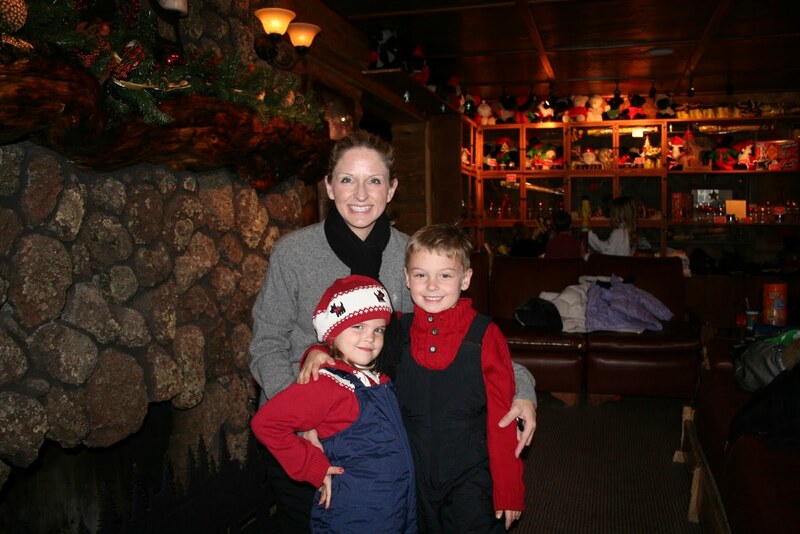 Sunrise is just down the way if you love to ski and we had the most wonderful experience with our first Sleigh Ride. Everywhere you looked it was blanketed with snow and we just so happened to take our ride when it was snowing. It doesn’t get much better than that. This trip most definitely got us in the Christmas Spirit. Merry Christmas!